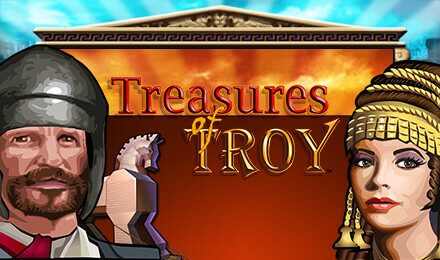 Play Treasures of Troy Slots with 1,024 ways to win! Take a trip back in time and spin to win Treasures of Troy Slots! There are 1,024 ways to win every time you spin, FREE spins and more! Good luck! Ancient Greek theme, up to 130 FREE Spins, 1,024 ways to win every time you spin and more! Interested? Sure you are! Play Treasures of Troy Slots today! The reels are filled with authentic symbols like Achilles’ Helmet, Helen of Troy and Menelaus, as well as the Trojan Horse, which is your Scatter – spin 3 or more to trigger your FREE spins! The Treasures of Troy symbol is your Wild, and can replace other symbols to complete a winning line. Login & play now!